829 pages. 9¼" x 6". Hardbound. 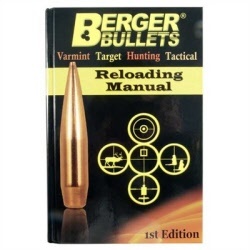 The first load manual from the renowned manufacturer of precision rifle bullets. Contains range/field/competition-tested loads tailored for Berger bullets in 71 different cartridges using all brands of powder. There are technical articles on a wide range of subjects by Bryan Litz, John Barsness, Eric Stecker, Walt Berger himself, and other respected experts in the field. Informative section for the new rifle shooter, including a “Handloading Basics” chapter, plus a full biography of the man who started it all, Walt Berger. Fascinating reading even if you never load a single round!